Allu Arjun’s Naa Peru Surya movie shooting almost completed and the promotional activities of the film already kick-started. In his latest interview with a popular Telugu daily on the eve of his 35th birthday, Allu Arjun made a few interesting comments on Mahesh’s Bharat Ane Nenu movie. “Bharat Ane Nenu definitely promises to be a different film. A star hero acting as a Chief Minister is no mean feat. 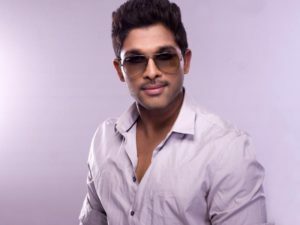 All the summer movies seem to be a blend of newness and variety,” said the Stylish Star. This patriotic action film is produced by Sirisha and Sridhar Lagadapati under Ramalakshmi Cine Creations banner. This marks the debut movie of Vamsi as a director who has earlier written stories for successful movies like Kick, Race Gurram, Temper. The movie also stars “Action King” Arjun Sarja plays an important supporting role and “Supreme star” R. Sarathkumar was roped in to play the antagonist. The soundtrack for this movie is composed by Vishal-Shekhar. Kotagiri Venkateswara Rao, Rajeev Ravi, and Rajeevan handle the editing, cinematography and Art direction respectively. It will hit screens on April 27, 2018, along with the Malayalam dubbed version.